TORONTO--(Marketwire - Sep 13, 2012) - For the second year, after pulling from its vast database of airfare searches, Cheapflights.ca, the online leader in finding and publishing travel deals, has ranked the 20 most popular Canadian and US border airports based on their affordability. Cheapflights.ca's 2012 Airport Affordability Index is compiled by computing the average airfare users found on its site during the month of August 2012 from each airport to the most popular domestic and international destinations. "Airfares are incredibly fluid, so it's important to find a way to look at relative costs for travellers," said Lauren Sullivan, editor at Cheapflights.ca. "Our annual Airport Affordability Index is a snapshot that shows how airports stack up against each other and, now, how they compare year over year. Of course we are talking averages, and we know that deals can be found at any airport. Our advice, as always, is to do your homework and be prepared to act when you find a great price." This year, Cheapflights.ca's report includes an additional column to show how rankings have changed since last year. Once again, the first and second spots on the list are Bellingham International and Detroit Metropolitan Wayne County -- both US border airports. Another US border Airport, Buffalo Niagara International, jumped four spots to take the third position in the list. The biggest jump in the list was Saskatoon Airport, which moved up 11 spots to sixth position. Cheapflights.ca's sister site in the US, Cheapflights.com, has also compiled an Airport Affordability Rankings featuring the average airfare to key destinations for the 101 most popular airports in the US. As many Canadians travel to, from and within the US, this report can be an additional useful guide for researching flight deals. Cheapflights.ca compiled this ranking based on user searches during the month of August 2012. The airports ranked were the 20 most searched Canadian and US border airports and the average airfares were calculated using the flight prices our users found to the most popular destinations, including Montreal, Miami, Los Angeles, London, Bangkok and Cancun. Cheapflights Media is an international media network helping over 11 million visitors a month find top travel deals. Our Cheapflights brand was launched in 1996 and pioneered the online comparison of flight deals for users. Today, users compare a wide range of deals from hundreds of partners including online travel agents, consolidators and airlines to find the very best flight deals. With a mission to be the starting point for travel, Cheapflights works to deliver the industry's best airfare bargains, expert tips and inspiration. There are currently Cheapflights sites in the U.K., U.S., Canada, Germany, Australia & New Zealand, France, Italy and Spain. For more information, visit www.cheapflights.ca. Our newest brand, Momondo, is a leading travel search engine for finding comprehensive worldwide pricing and availability on airfares. Winner of several awards, the site is ideal for users on specific travel schedules. For more information, visit www.momondo.com. 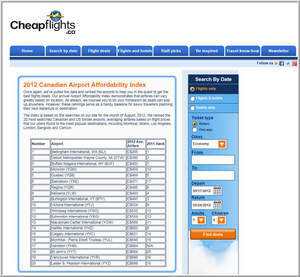 Screenshot of Cheapflights.ca's 2012 Airport Affordability Index ranking 20 Canadian and US border airports based on average airfares to popular destinations. See how your local airport stacks up with other airports and versus last year.